I have no info as to who the members are, or indeed how many people are involved. I know from the info received that Lecanoscope have been plugging away on the underground scene for over a decade now. They have released cassettes and have been included on various compilation CD's. This is their first CD release to date. Comparing Notes is a CD EP lasting just over twenty minutes in length and it comprises of five excursions into the world of hypnotic ethnic orientated trance. It starts with the 5.14 minute "Kuya Drill". This track is very transient and offers mellow ritualised Didge patterns mingled with ethnic drum rhythms. It is a repetitive piece that boarders on new age orientated material. The start reminded me of Eat Static's 'Abnormal Interference', for it uses similar vibes to create its atmospheres. "Kuya Drill" did not leap into the blatant techno styled drum motions of Eat Static, which was a relief I can tell you. It weaves around its structure in what the band term as ethereal ritualised trance, and it moves along in that fashion. "Asaresult" is a 5.01 minute track that uses a tabla pattern as its beat structure. It is very much in the ethnic vibe, and builds very gradually over the 5 minutes. The beat never gets monotonous as the track has plenty to keep you going without thinking of the beat. The synths motion too and fro, and there is some interesting wah wahed things going on... quite Hawkwind in certain ways. Bits of "Shade Gate" sounding stuff here and there keyboards-wise. Mellow stuff. "Waterlilly" starts out as an eerie haunted piece, slow and atmospheric. Another percussive ethnic drum emerges through the Didge droning. I think it could be a Synth Didge but I hope that it is played. Somehow, I think not. The track stays in its settled form for nigh on 6 minutes in length, setting the atmosphere for the next track. "Dual Unity" could be likened to certain phases of Pink Floyd's More. It is strange to think it but it does to a certain extent. As does "Somnambulist Transmitter", this track is more like More than "Dual Unity" is; the drumbeat is very in that Tom beat mould. It could almost be off Zabriski Point as well... very "Heart Beat Pig Meat". I like it. The whole album is interesting in its structures. Very much ethnic ritualised trance. 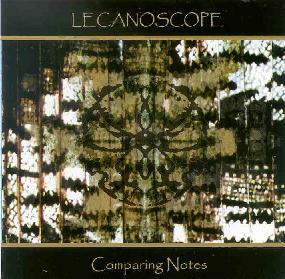 Lecanoscope are a creative band that delve into good spacey vibes with that ethnic feel. Essentially it is in the ambient trance rhythms mould rather than the dance rhythms mould, although you could dance to it. They say that it is designed to open the third eye, possibly a bit too late for me as Hawkwind and Tangerine Dream did that for me years ago, as well as mushrooms! However, I can see that for the hippy new age chemical kids who are posturing the halsana whilst meditating on tat twam asi. I am sure it would be enlightening. I just think that it stirs old stuff inside a new form. A good album or should I say EP for it only lasts 20 odd minutes. That is my only gripe. It should have been longer. But none the less a fine well done EP with a nice cover. So there ya gan. For more information you can visit the Metabolic Music web site at: http://www.metabolicmusic.com. Contact via snail mail c/o Metabolic Music; PO Box 4517; Redondo Beach; CA 90278.